Whether your celebration calls for traditional seating of 200 guests or a small, intimate setting, Unity of Bon Air offers the ideal venue, bringing the peaceful elements of nature into contemporary comfort. The new sanctuary fills with the warmth of sunlight filtered through expansive picture windows overlooking the Meditation Gardens. Our inviting new church building welcomes all to celebrate your wedding ceremony in the spirit of love and shared happiness. Scroll down to view your options. Do you desire a ceremony, led by your chosen celebrant, in climate-controlled comfort with easy access for all guests? Your unique ceremony is enhanced by beautiful surroundings and radiant natural lighting that streams from the gardens into the sanctuary for full effect. The joyous energy of your special day comes to life with grace and beauty to focus on the vows you exchange with one another. A state of the art sound system is available. 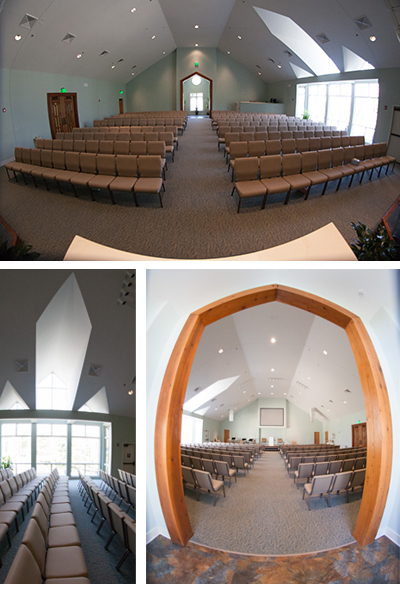 The new sanctuary comfortably seats up to 200 guests. Most ceremonies rent for $650 for a 3-hour period of time. Reduced rates for Unity of Bon Air community members. 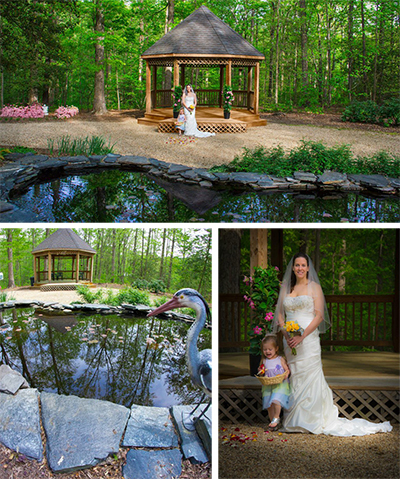 Would you prefer an outdoor wedding, complete with singing birds and seasonal colors in bloom? Our lush Meditation Gardens are one of Richmond’s best kept secrets, yet a perfect place to hold your ceremony. The central gazebo and nearby lily pond are situated on two acres of natural and cultivated gardens, to accommodate both private and larger guest lists. Meandering pathways delight guests of all ages, leading to a nature-rich experience of your special day. Do you seek a smaller, informal setting with the pleasing sound of water trickling from a picturesque stone fountain wall? The Garden Terrace provides a lovely, open-air extension of New-Rock Hall. Its casual charm offers an attractive backdrop to your ceremony and quickly converts to an indoor-outdoor reception facility for continuous celebration. Ceremony seating arranges for up to 30 guests. The reception hall includes a catering-style modern kitchen and entertains up to 150 guests. Create your own personalized reception wherein guests mingle over light hors d’oeuvres or enjoy a sit-down catered meal. By special permit, beer, wine, and champagne are allowed. Reverend Laura Barrett Bennett or Reverend Valorie Kay are available for ceremonies, pre-marital counseling, and spiritual guidance. The minister will work directly with you to create a service that celebrates, honors and affirms your commitment to one another in a way that is meaningful to you. Janie, Life Events Coordinator at (804) 432-2038 or life@unitybonair.org.